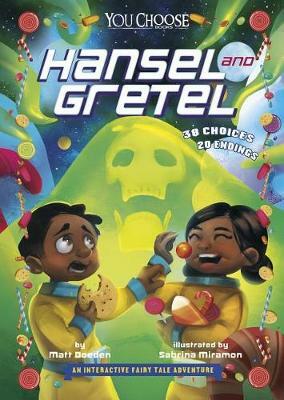 This You Choose adventure is told from three different perspectives--the witch tries to explain that her motives are innocent; Gretel helps her brother Hansel explore a planet made of chocolate; and Hansel follows his wheelchair-bound friend Gretel into a virtual reality simulati... read full description below. Matt Doeden is a freelance author and editor from Minnesota. He's written numerous children's books on sports, music, current events, the military, extreme survival, and much more. His books Sandy Koufax (Twenty-First Century Books, 2006) and Tom Brady: Unlikely Champion (Twenty-First Century Books, 2011) were Junior Library Guild selections. Doeden began his career as a sports writer before turning to publishing. He lives in Minnesota with his wife and two children. Sabrina Miramon is a French artist and illustrator living in Cambridge, UK. She became a freelance illustrator in 2015. Since then she has worked on many international projects designing animation backgrounds, board games, and video games. Her clients include Ankara (Wakfu), Nickelodeon, Virgin Media, Asmodee, and Days of Wonder. When she's not working, Sabrina loves looking at pictures of fluffy dogs on the Internet and playing video games.